I'm using the example of Tokyo, Japan, as it is a massive megacity and also, from personal experience having lived there for 4 years. Image source and further information. 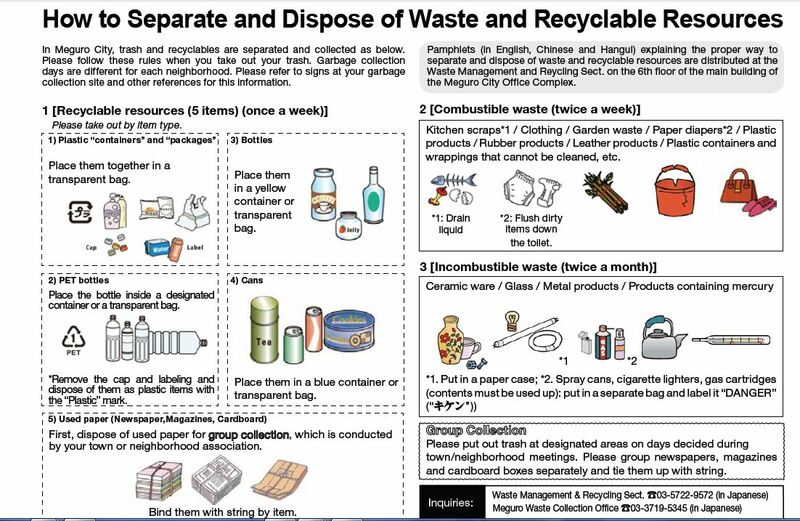 Image source * Even though the website discusses Manila, Philippines waste disposal, the image is taken from Meguro-ku, which is part of Tokyo. How sustainable is this type of waste segregation and recycling program? Actual data would be appreciated. 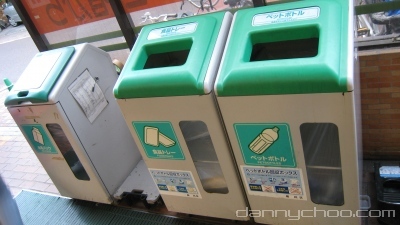 There is another category called "sodai-gomi" (bulky rubbish). The definition of this is over 30cm in any dimension. (See http://www.city.toshima.lg.jp/kankyo/9316/009383.html in Japanese) You have to book the pick-up in advance. Most recycling shops will only take goods in excellent condition, or only in a certain category. They pay a few ten or a few hundred yen per item, generally about 10% of what they think they can sell it for. My favourite shop is: http://kingfamily.co.jp/ (sorry, Japanese only). They will take everything (though clothes only). They pay 100-150 yen/kg for items they think they can sell, and 1 yen/kg for everything else. The unsellable clothes either get sold to factories (for "sofa filling" when I asked), or shipped overseas. I should also point out book recycling. Lots of small 2nd hand book shops, but there is enough profit for a big business: http://www.bookoff.co.jp/en/ (corporate site, but at least it is in English). Book Off are a delight in that they will buy everything (usually at around 10 yen a book); the smaller shops have limited space so just take the pickings. 2nd hand books sell at between 100 and 1000 yen. Back to the theme of "sustainable", the real potential is at the other end: the Japanese obsession with packaging. It is no exaggeration to say it is typical to buy individually-wrapped sweets or biscuits, which will be in a box, which is covered in plastic wrap, which will then be put in a bag unless you beg the shop not to give you a bag. Given the very low nutritional value of the food, this is around 99% waste. Supermarkets now either charge 5 yen or so per plastic bag, or give you a 2 yen or so rebate if you say you don't need a bag. Convenience stores do not do this currently.